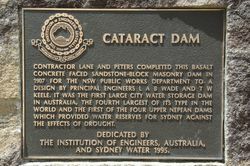 A plaque recognises the Cataract Dam as a National Engineering Landmark. 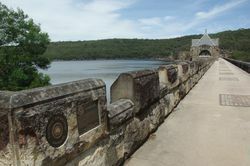 CONTRACTOR LANE AND PETERS COMPLETED THIS BASALT CONCRETE FACED SANDSTONE BLOCK MASONRY DAM IN 1907 FOR THE NSW PUBLIC WORKS DEPARTMENT, TO A DESIGN BY PRINCIPAL ENGINEERAS L A B WADE AND T W KEELE. IT WAS THE FIRST LARGE CITY WATER STORAGE DAM IN AUSTRALIA , THE FOURTH LARGEST OF ITS TYPE IN THE WORLD AND THE FIRST OF THE FOUR UPPER NEPEAN DAMS WHICH PROVIDED WATER RESERVES FOR SYDNEY AGAINST THE EFFECTS OF DROUGHT. 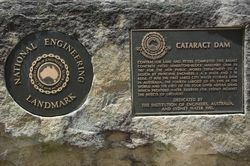 DEDICATED BY THE INSTITUTION OF ENGINEERS, AUSTRALIA AND SYDNEY WATER 1995.